November appeared a quieter time in the garden. Although the mild weather has meant that some things are still flowering that really shouldn't be (I'm looking at you nasturtiums), much of the garden has moved into shadow, and the main changes can be found in the kitchen garden. 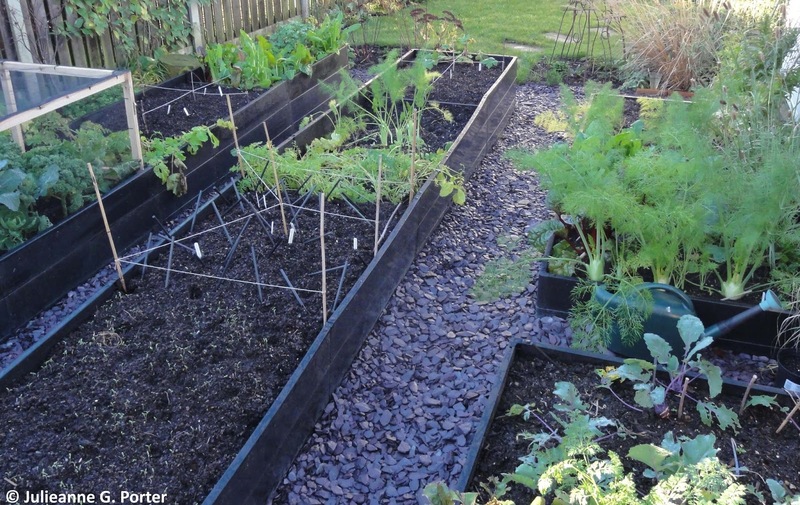 At the top left of the photo above you can see part of my new Brassica cage that Kevin build to spec to suit my long but only .75cms wide vegetable beds. The long sides, where the paths lay, lift up for easy access and the whole thing is light enough to me to lift off entirely if I need. 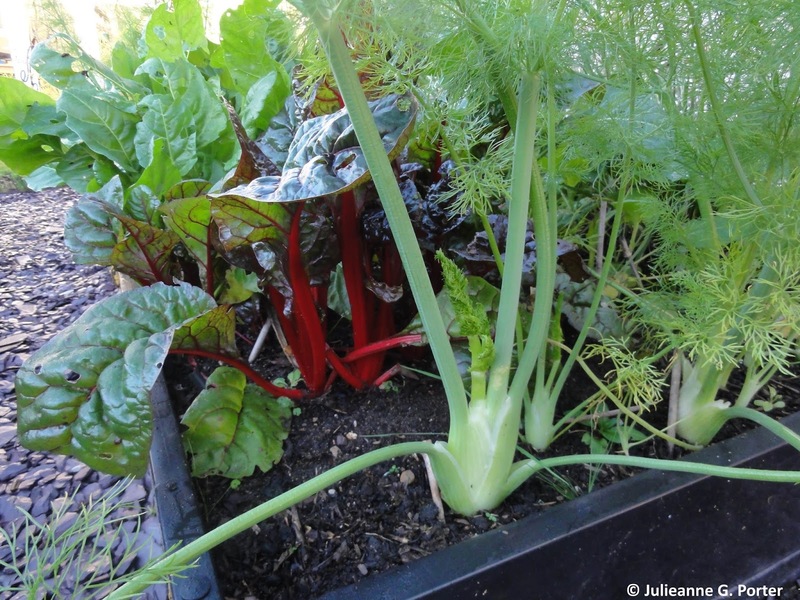 Throughout November I've been harvesting kale, fennel, chard and spinach, carrots and kohl rabi. And now that we have had some frosts, I'll be able to start cropping the parsnip in December. I do have some winter potatoes under fleece (the pointy white thing in the top photo, to the right of the mini greenhouse) but I'm not sure they will get enough sun to do much. I have seen some foliage at the top of the pot, so you never know. As I mentioned, much of the garden moved into shadow during November. 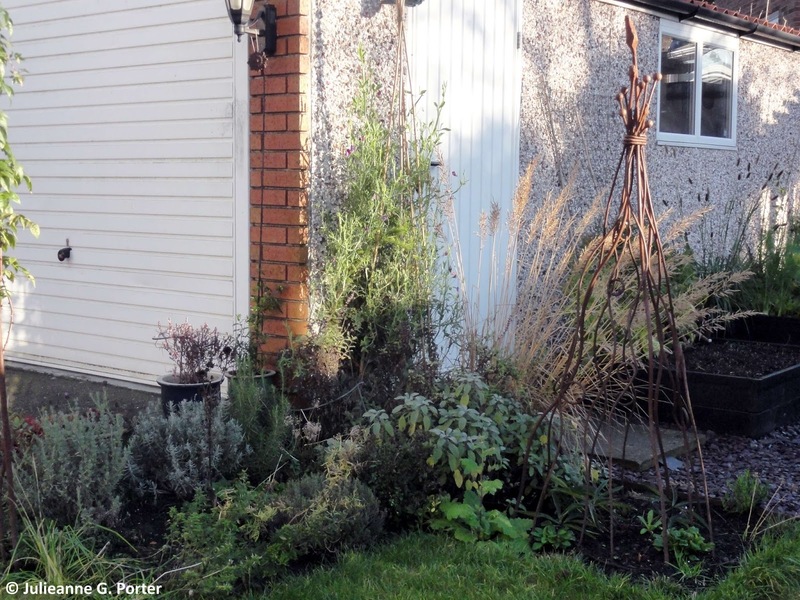 By now the only borders that get direct sun are along the left side, the Strawberry and Herb borders, plus the vegetable borders alongside the garage. The top half of the pergola gets quite a bit of light, which might explain why the tall sunflowers continued to flower until the last couple of days. 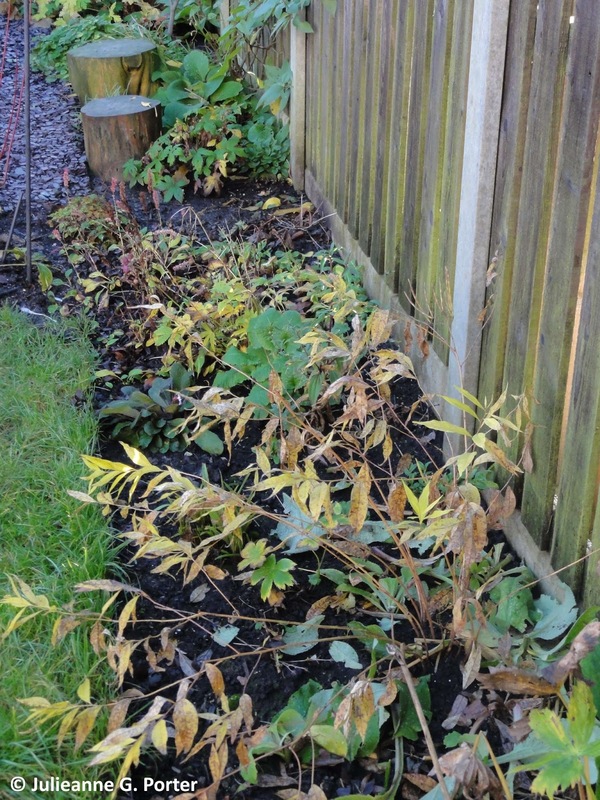 The Shady Border (part of it above) gets no direct sunlight at this time of year. It's not in dark shade, but it is shady, hence it's name. 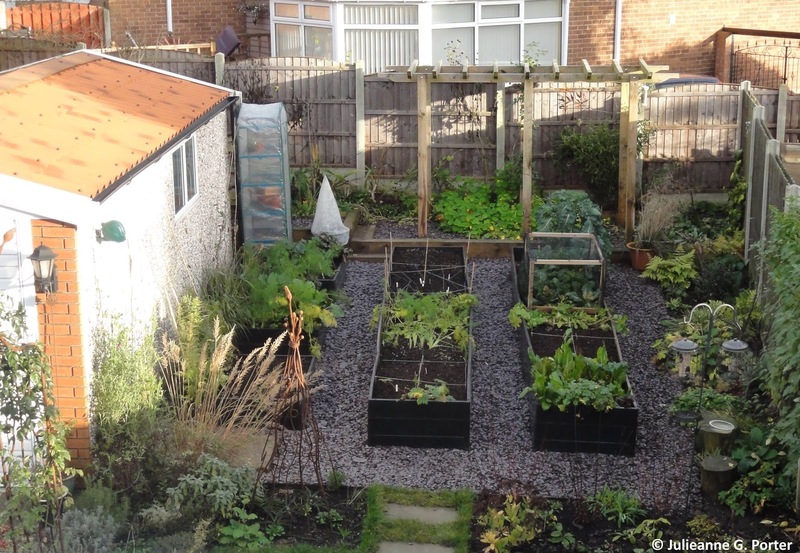 As it is getting stripped back to it's bare bones, I'm contemplating how I can improve on the structure and give it more all-year-round interest. In fact, this border is going to be my focus for next years EOMV, as I feel it needs work and the focus EMOV gives I hope, will help me develop this border. There were a few plants of note in this and other parts of the garden though. A little dirt splashed, but Primula 'Guinevere' has re-flowered. This hasn't minded being in the boggy part of the border, so seems to be ok having it's feet wet. 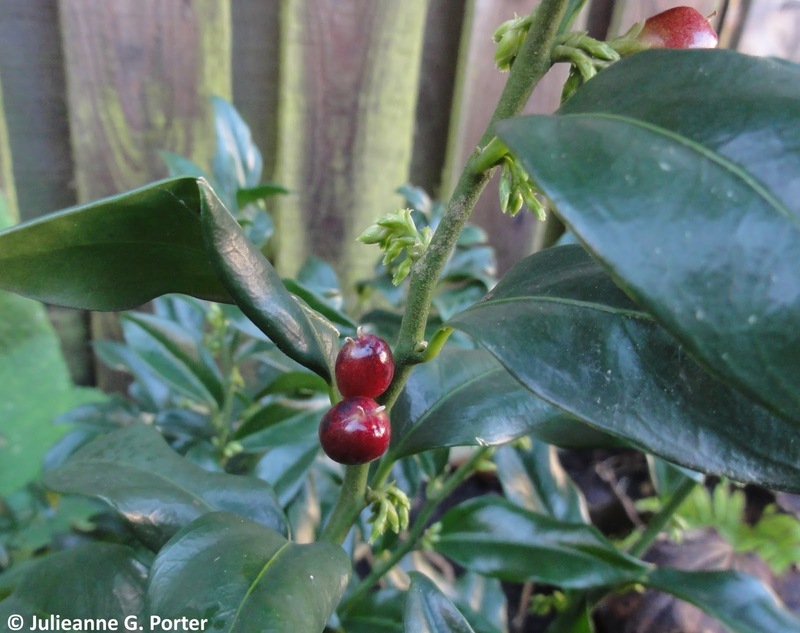 You have to get up close, which is of course half the fun, to see the red berries on the Sarcococca confusa. And coming up at the same time are the flowers for this winter, which I think may open in December. I'm looking forward to that wonderful fragrance to lift my spirits on a grey short winters day. 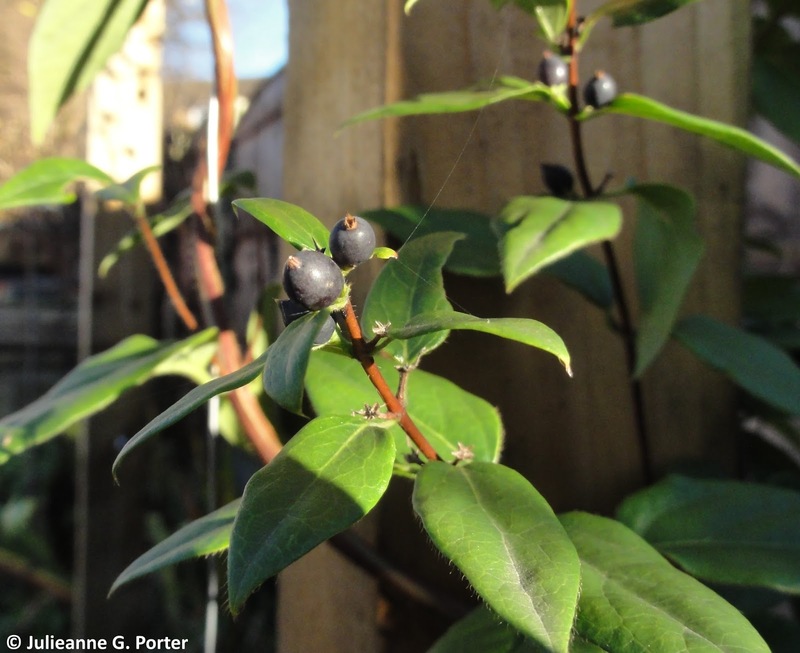 And there are also the black berries of evergreen Lonicera similis var. delavayi basking in the sun on the pergola. I wonder if the birds will eat these? 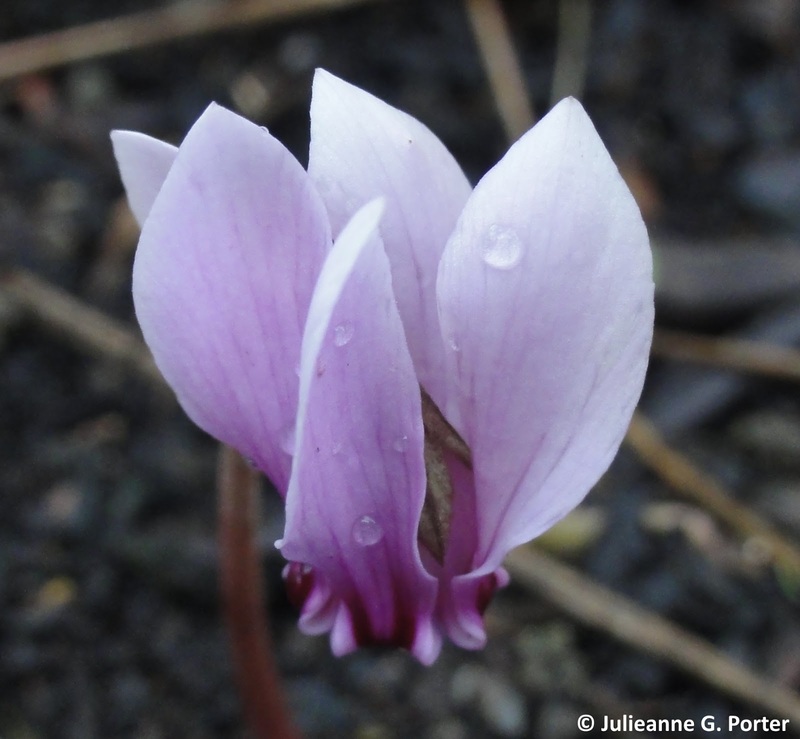 I only planted the corms in October, but clearly this Cyclamen hederifolium was keen to get going. 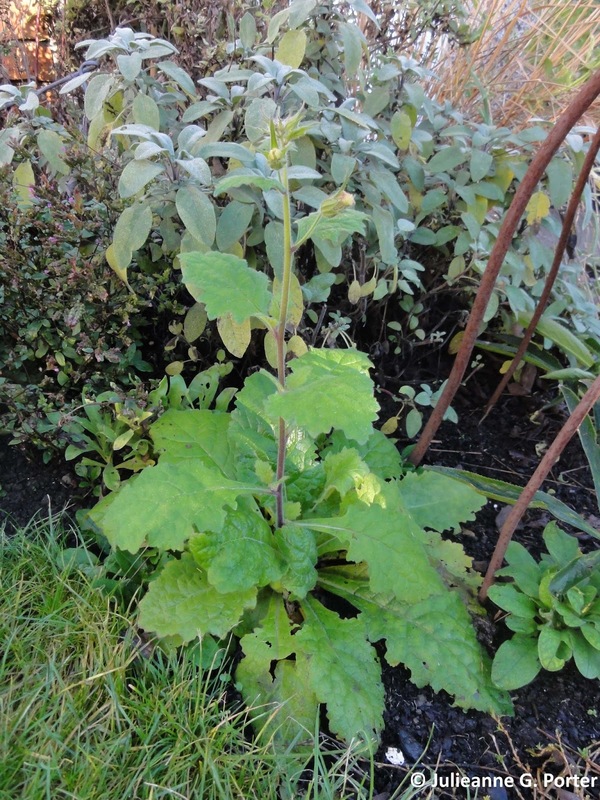 I'm however, confused about the next plant that is about to re-flower, Rehmannia elata, Chinese foxglove. It's not meant to be hardy and it's getting very little direct sun, but it's clearly determined to have a second show. I suspect the predicted cold whether in the next week will do it in before it does flower again. Such a shame really. 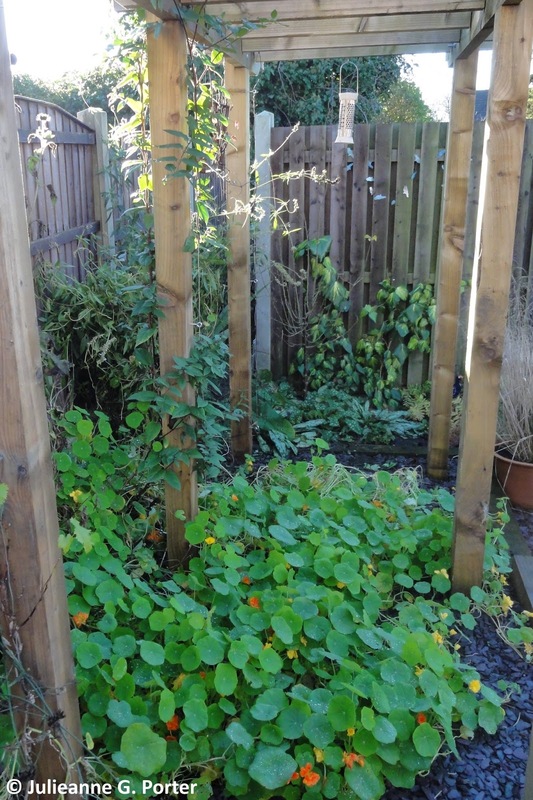 And lastly, those nasturtiums. Those damn nasturtiums are still going strong. Despite 2 frosts now. I think I'm going to have to bite the bullet and pull them out if the frosts predicted this week don't do them in. I have some bulbs to put in their place, and as pretty as they are, I think it's time they gotta go. I'm pleased to see that as the garden puts on it's first full winter coat (the first full year of the garden existing), it still has food to harvest and flowers, berries and foliage to enjoy. End of month view is hosted by Helen Johnstone, aka @patientgardener. 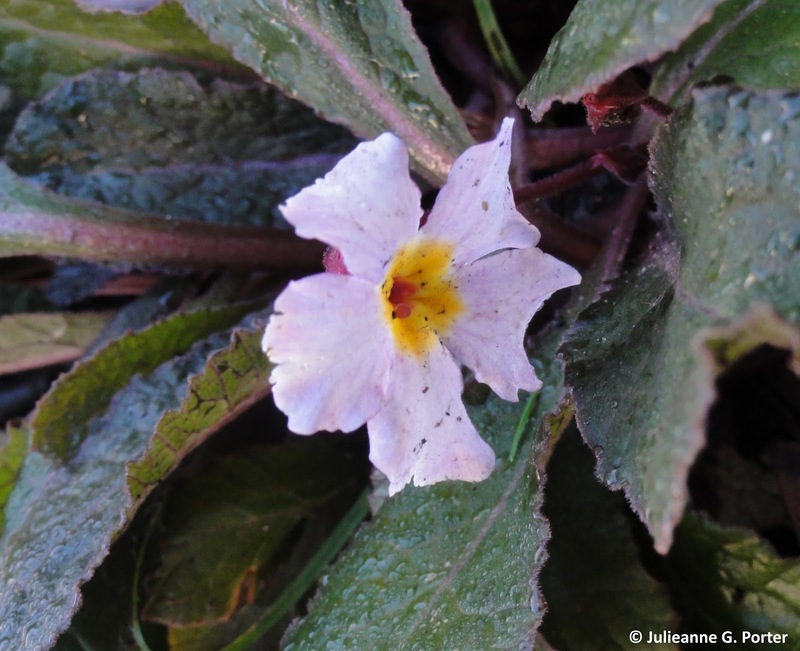 Visit Helen's blog for her November 2014 EOMV and links to other bloggers EOMV posts. It's nice to look at the detail - especially those lovely cyclamen propellers - but the view from the study does show how it's all tying together really well, even now. I look forward to seeing what you'll do with the shady border. And this year's nasturtiums and sweet peas... what's *that* all about? Our sweet peas are still going crazy here too. 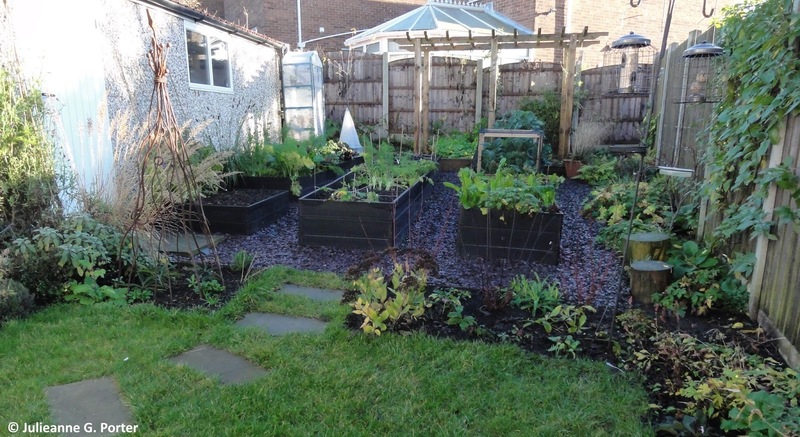 Your garden is still looking great and good to read you are still having harvests Julieanne. Your garden is pretty much like mine at this time of the year - little direct sunlight, yet still we get some blooms. I do hope your foxglove gets to flower, such a shame for it not too since it's put in so much effort. As usual, your garden is very tidy - a credit to your hard work and effort.